Great bars. Fit on my wife's 86 Rebel with the stock cables. They look great. Nice quality product. My husband love this site!! Very comfortable! 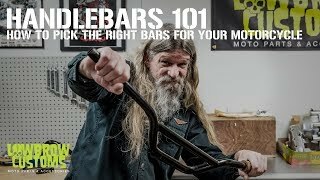 these bars were the first mod I made to my xs650 when i got it, and were exactly what my bike needed to boost the look and bit. They were packaged very well too. no fear of them getting scratched or nicked in transit. BUY THEM! you won't regret it!!! How tall are they in inches? There is a dimensional drawing of the bars at the listing it states they have a 7" rise and that is measured center to center so if they are a 1' diameter if you add 1 " that would mean they are approx 8" overall.